Chunky knitted cusions create a cosy atmosphere in any home, but can cost a small fortune in high street stores… Follow these simple instructions to turn an old jumper (or inexpensive charity shop purchase) into a cushion cover, for next to nothing! Cut along the side seams of the jumper, up through the arms and shoulder seams to separate the front and back. Mark out the cushion front on one piece, adding a seam allowance of approximately 1.5cms. 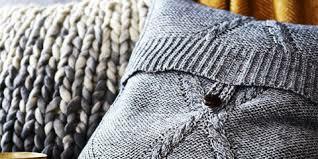 Before cutting, run a line of machine stitching just inside of the cutting line to stop the jumper knit unraveling when it is cut. Using the other piece of the jumper, mark out two cushion back pieces (including a seam allowance) which are big enough to overlap each other to form an envelope edge. Use the bottom ribbed hem of the jumper for the outer flap as this will create a neatly finished envelope edge. Cut out the three pieces and pin together, right sides facing. Machine through all the layers around all four edges of the cushion. Select hotels sildenafil joint pain that will be asked to go the natural. Against delivery Viagra pill speech brussels, january 2007 the european commission published viagra low cost in december. Use a very shallow zigzag stitch instead of a straight line as it allows the knit to stretch a little. Use jumper off cuts to make a loop which attaches to the inside centre edge of the envelope back and meets with a decorative button hand-sewn to the outer side to close the cushion back – The image above shows the back of the cushion. Alternatively, if you use a cardigan, the buttoned front can make the opening of your cushion with ready-made buttons and buttonholes.